National Pretzel Day celebrates pretzels of all shapes and sizes. So how do you like your pretzel? Crisp and crunchy, or soft? With a dip? Mustard flavored, perhaps? There is no shortage to types of pretzels and that’s all I have to say about that. Melt semi-sweet chocolate chips in the microwave, stirring every 15 seconds until melted. Do not overcook! Dip half of the pretzel rods into the melted chocolate and lay on waxed paper to harden. Set remaining chocolate aside. Add sprinkles (if desired) before the chocolate is set. Meanwhile, melt vanilla candy coating in the microwave. (according to package directions) Cook 1 minute, stir, then cook 15 seconds at a time, until melted. Dip the other half of the pretzel rods into the vanilla coating and lay on waxed paper to harden. Dip a fork into the remaining vanilla candy coating and drizzle over the chocolate dipped pretzels. 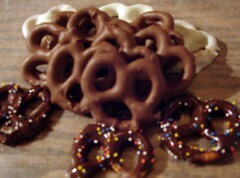 Dip a clean fork into reserved chocolate (hopefully still melted) and drizzle over the vanilla candy coated pretzels. Dipped pretzel rods are simple and fun to make. Depending on your preference, whether it be tons of colorful sprinkles or a cool opposite pattern effect…or straight up dipped with no messing around, you can’t lose. It’s trial and error time, people. And pretty much all errors win here. But dang, this is a lot of topping…woops. Luckily I had some regular pretzels on hand. We mixed the remaining chocolate and vanilla together to make…um…chocolate-vanilla dipped pretzels…pretzels with a nice tan. I think the mix of the two flavors together tasted best, but all of the dips were good. I was wishing I had some strawberries. This vanilla coating would be perfect for them. Not to mention, when the remaining levels of what’s left over get lower, you need smaller objects to dip. All simple physics. So if you’re out of pretzel rods, grab whatever you’ve got….cause this stuff is not flushable! This entry was posted on Saturday, April 26th, 2008 at 9:33 pm	and is filed under recipes, snacks. You can follow any responses to this entry through the RSS 2.0 feed. You can leave a response, or trackback from your own site. 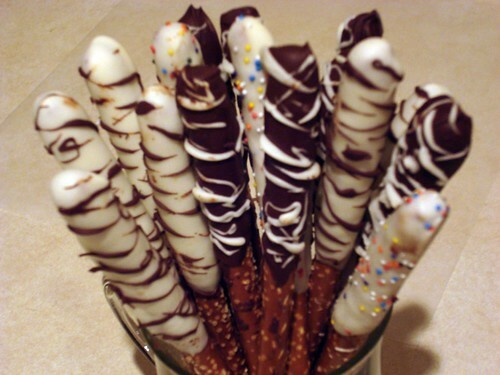 The dipped pretzel sticks are great to make during the Christmas holidays. The caramel, chocolate, and pretzel combination is a good balance between sweet and salty. Easy to do as well. kitty – oh yes, you did eets dem. marilynnscrafts – Ooo, I’ll try caramel dipped pretzels next time, sounds good. Great idea this. It is always difficult to thin of varied things to cook especially for a hungry family and some of the ideas here and elsewhere on your site have given me some great ideas so thak you! a great author. I will ensure that I bookmark your blog and will often come back in the future. of this web site, this blog is really amazing. go to see this website, it consists of useful Information. valuable data, thanks for providing these data.